Trials, Trails and Travels: Just where is RossBondReturns? Hey there! Thanks for dropping by Ruminations of RossBondReturns! Take a look around and grab the RSS feed to stay updated. See you around! After months of silence and rampant speculation, and tons of totally unconfirmed story details which have caused some fans to prematurely bury Paramount’s reboot of the Terminator franchise; we finally have the first Trailers, both Domestic and International. I have chosen a selection of screen shots out of the 600+ I took to discuss elements shown to us by Paramount in their first trailer for next July’s release. They will be discussed in the order they appear in the trailer. 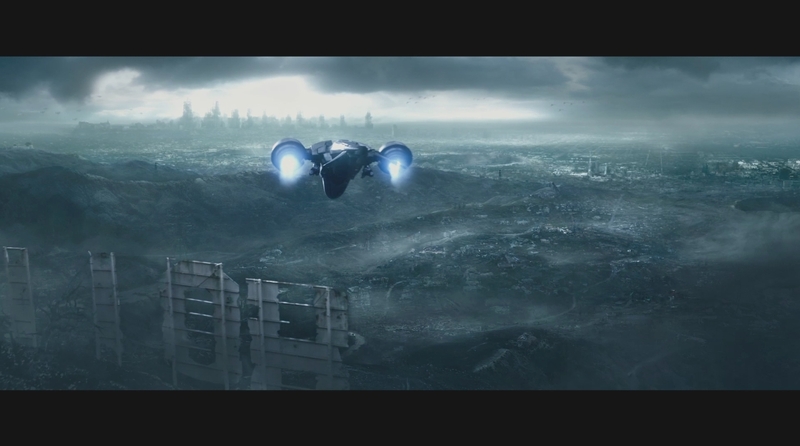 The opening shot shows a burned out Los Angeles and Environs, an ash heap of destruction, painted in an almost noir-like lack of color. This perfectly captures a daylight look at the wasted, nuked, visions of the future described by Jim Cameron. Three newly designed aerial H/K’s move through the scene towards the towering, shattered, spires of the Los Angeles metroplex. How this connects to the other Future War scenes we don’t yet know but it sets a tone of desperation, something some would argue that was missing from RoTM and Salvation. I’ll discuss machine redesigns later. 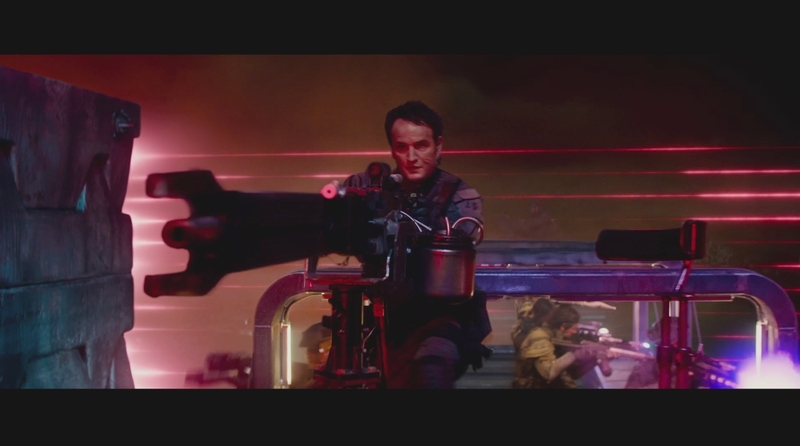 Here John Connor (Jason Clarke) prepares to fire a mounted Phased Plasma Weapon, behind him we see for the first time on film the red laser nets marking the place of battle to be at least in part a Human Detention Camp. You can also notice the beautiful purple nature of the phased plasma bolts from T1 and T2 is back. It looks like the Resistance will be using both scavenged tech, and modified human tech made Plasma capable. This looks like Cameron’s Future War or at the very least as close as we are going to get unless Cameron does re-imagine the series after the rights return to him in 2019. On the right we see waves of endoskeletons, and coming in from above and the ground on the left human resistance forces. 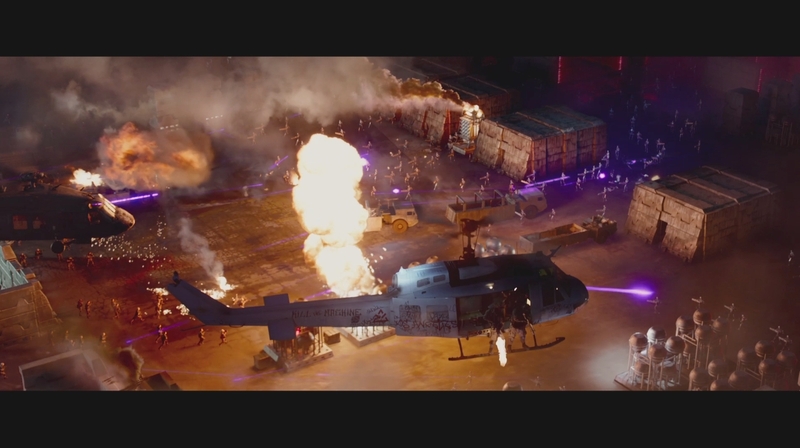 It is clear from the helicopter that humans use both conventional and plasma weaponry. It is quite possible that in this future humans find it hard to replicate/procure/manufacture plasma weaponry on helpful scale. We can also see the laser nets, but the detail I find most interesting is the crystalline/angular designs of the machine buildings. This kind of design was prevalent in Cameron’s sketches of machine architecture so it’s very nice to see it fully realized on the screen. Let’s discover more after the break! Genisys Website, Trailer Tomorrow! Poster, Composer and Tagline Today! There will be lots of Terminator Genisys news hitting in the next couple of days. If you visit Terminator Genisys Site/Motion Poster! Once the hourglass motif motion poster has played a countdown will appear for the official release of the first Terminator Genisys trailer! We are very close Terminator fans! In other news Christopher Beck (Edge of Tomorrow) has apparently been hired to do the music for the film. Good luck to you sir, know that there is a bias against you already (not on my behalf). Also some friends have done some code digging on the site and found a background with the tagline: Time Is The Ultimate Weapon.– expect to see that soon. Expect a lot of images tomorrow or Friday depending on if I have time, I’ll dertainly post a detailed breakdown/analysis of the trailer as soon as I can. Until then, Hasta la Vista! Skydance Hitting the “Reset” Button With Genisys Trilogy and More! There’s been quite a bit of talk about Terminator: Genisys in the last week from actor Jai Courtney who is playing Kyle Reese in the film which hits July 1, 2015. He’s talked about the films POSSIBLE rating based on the film they shot and their not being any f-words in the script as likely to be PG-13. I shouldn’t need to remind anyone how dark and gritty a film can be with that rating. I will also remind you that the film is still being edited, sound designed, digital effects created and fine tuned etc. and thus for obvious reasons the film itself has not been submitted for a rating from the MPAA. He also mentioned that it was kind of funny working with the endoskeleton actors in that they were people dressed in performance capture suits. This has me very excited as such technology really has a chance to bring the endo armies of Skynet to life in a way that will make them seem more real than ever before. For those who are worried about that meaning there was no puppetry work at all, we have really no information either way but I’d say that there would still be puppetry work in certain shots and circumstances. I think Terminator and Jurassic World both sequels I’m greatly looking forward to using performance capture technology for Endos and certain Dinos respectively it makes sense to embrace the advancements in technological outgrowth and film making enhancements. Jurassic World and Terminator: Genisys hitting IMAX! As you know I’m very excited for next year as my three favorite franchises are getting new installments in 2015. Jurassic World roars into theaters first on June 12th. Terminator : Genisys erm … terminates audiences Starting July 1. James Bond returns to theaters Late November / Early December. While there will be plenty of reporting on on Bond in the foreseeable future today’s report is is talking about JW and T:G.
In a members only article I’ll link ( for reference sake) to at the bottom of the post comes this news about the two eagerly anticipated sequels. I remember walking out of the theater after seeing Jurassic Park III my mind practically on fire with where I as a fan and screenwriter would take the JP Franchise. From my perspective I personally felt that the best option was, not surprisingly exactly what we’re getting, a soft reboot. There were certain things that I had enjoyed from the novels which had never made their way into any of the films, so I relished a re-read of the two novels. Once that was behind me I was faced with the problem of where to take the story, I wanted it to continue and I really felt that there was still at least one story which needed to be told. A working theme park a fulfillment of John Parker Hammond’s dreams. The greed assisted failure of the first film and The Ingen Incident in San Diego in the second and the events of JP III the third. How could a theme park come into existence through Ingen with such issues in the past? The answer to that problem was a simple in that it couldn’t, and that the books gave me something that the films largely avoided…another company that could: Biosyn! My three favorite movie franchises are Terminator, James Bond and Jurassic Park! All three have films hitting the big screen next year but tonight I am going to devote some time to discussion on the latest film in the Jurassic Park film universe titled Jurassic World (JW)! Universal Pictures has been quite eager to revisit the Jurassic universe and so they should be the original JP has all by itself (including the 3-D re-release) grossed $1,029,153,882, The Lost World: Jurassic Park grossed $618,638,999 and Jurassic Park 3 added $ 368,780,809. One could argue that as the quality of the stories declined that the total gross declined accordingly, however I can say that I have been waiting along with many others for a revisit to the franchise. And as is often the case the film has gone through a long developmental process. There was a script by John Sayles which had human dinosaur hybrids that toted machine guns somewhere along the way. However things picked up speed when the writers of Rise of The Planet of the Apes wrote a draft which featured a working park full of visitors where nothing could possibly go wrong…right. I just know I’m going to get into spoiler territory because a lot of information hit the web over the last couple of days so if you want to remain spoiler free please remain on this side of the break. And before I move onto the next page let me simply state that JW is a soft reboot of the series that takes place 22 years after the incidents of the original Jurassic Park. In a working theme park. And is being directed by Colin Trevorrow with Steven Spielberg producing and a fantastic cast including Bryce Dallas Howard and Chris Pratt, and music by Michael Giacchino. It comes out of extinction June of 2015. If you want to be spoiled then come through the gates into Jurassic World! Filming the Future War for Terminator: Genesis! As I suspected the videos from late night filming on Terminator: Genesis did not last long, I’m very glad that I took the care that I did to preserve them so that I could bring you this report. Filming is now going great guns on Genesis, slated for release July 1, 2015. Just recently some short clips of filming in Louisiana have popped up along with stills showing cars used in replicating a certain sequence from The Terminator. Arnold has stated that the actions is as Big as the action in T2 and as recently as yesterday character actor J. K. Simmons called the script a “smart re-imagining”. It seems unsurprisingly that Paramount and the others players behind the planned Trilogy of films are taking things very very seriously indeed. Including taking down the videos I’m about to talk about not once but twice at a minimum. One of the main reasons is that Paramount et all don’t want behind the scenes footage leaked period, however when one is talking about the shooting of FUTURE WAR set segments any moment could be a huge spoiler. However, being that the resolution is 240p I felt that at the very least I would take a few shots to give you some idea of the first T1-T2 styled Future War action since T2:3-D Battle Across Time! Possible Spoilers after the break! So the other day I decided to walk around town a little bit more than usual and anyone who knows me is fully aware that I walk around town a LOT. However yesterday was a little bit different in that I ended up at the local Salvation Army Store- the one in Redlands California is more like a Antiques repository but on the right it still has DVD’s, Video/PC Games, Comic Books and Collectables…and Music CD’s. I actually went in to look at the DVD’s as they are priced to move and often have a good selection of films that I’ve wanted to see and have never been able to. Aeon Flux caught my eye right away, it had a strong chance of being picked because it ticked all the right boxes for the kind of film I wanted to experience. However in the end I found myself kneeling in front of the CD rack and looking very carefully at the titles for anything I might like. It turns out there ended being two items that grabbed my attention…well to be honest 3, but when I opened the first one I found the dreaded stolen/missing disc staring at me. So I handed it to one of the workers to get it out of circulation.